Out of the collaboration between Arne Jacobsen and Louis Poulsen (from the beginning of the 1930s to 1971) a range of Arne Jacobsen lamps were produced — e.g. the elegant series, developed in connection with furnishing the SAS Royal Hotel interior in Copenhagen. The series of Arne Jacobsen lamps comprises a standard lamp, wall lamp and table lamp in, amongst others, white, graphite grey and black. The asymmetrical shade form of the lamp pictured to the left concentrates the light in the direction where it is needed, making it possible to have the light switched on and read without disturbing your companion or neighbour. The straight lines and oblique angles in Arne Jacobsen lamps evoke Arne Jacobsen’s style of architecture and blend well with the design of the SAS Royal Hotel building itself. The hole cut away in the centre of the table lamp’s foot, which is made from cast iron to give the lamp stability, was from the start adjusted in size to make room for an ashtray. But also without ashtray the hole in the foot contributes to the series’ elegant and light design language, and complements the lamps' form. The range of Arne Jacobsen lamps also comprises a pendant lamp, once again originally developed and produced for the SAS Royal Hotel in Copenhagen – though in a special edition with copper shade, which today is far rarer than the usual colours. Arne Jacobsen designed all the objects for the interiors of his architectural projects himself, it not occurring to him to use others’. Today the pendant lamp comes in two different sizes. The larger is 50 cm in diameter and has four sockets as light source, whereas the smaller of the two is 37 cm in diameter and only contains one central light source (earlier versions have three sockets). 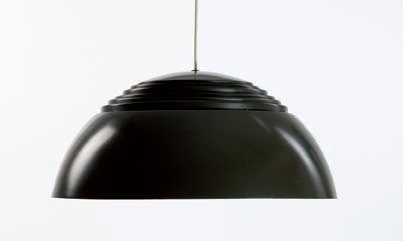 The pendant lamp was originally produced in dark brown, black and pale grey. The otherwise very simple design language of the pendant lamp was expanded with blades, where the light could penetrate upwards as well, and in so doing give the lamp a soft glow. The AJ pendant lamp is still produced by Louis Poulsen, just as many of the other Arne Jacobsen lamps, though exclusively in white. The standard lamp to the left was designed in 1957, together with a number of other Arne Jacobsen lamps, for the interior of the Hotel SAS Royal in Copenhagen. The architecture and interior stand today among the finest examples of the functionalism that Arne Jacobsen represented – and this in spite of the hotel at the time being voted Copenhagen’s ugliest building. The furniture and interior have since become classics, just as the hotel building itself, which each year is visited by numerous architects in addition to hotel guests. It is typical for many Arne Jacobsen lamps and much of his furniture that they actually only came to be developed in connection with his own building projects, which in turn came to be furnished according to his own ideas. Originally the lamp came with a linen shade. Today production has been resumed by Santa & Cole, but with an opalized plastic shade.